Hello everyone! So, I knit some more sweet tomato heel socks over our last couple of times on the road. After making a few pairs using thicker-than-normal sock yarn, I wasn’t sure how I’d feel about using the “real” stuff. But as it turned out, I thoroughly enjoyed watching the tiny neat stitches appear one after the other, and it didn’t bother me that it took a little longer. I divided the yarn by weight, thinking that way I could make both socks from the toe up, stop when I ran out of yarn, and they’d end up pretty much the same length. But, I threw in enough experimenting that my yarn usage wasn’t the same at all on the second sock … I should have known that would happen! Next time I’ll either make both at the same time, or, if after the first heel I want to try something different for the next one, I’ll wait to finish the legs until I see how much yarn is left. Another thing I learned while making this pair is that for my feet and legs, 425 yards of fairly standard sock yarn will make a boot sock, tall enough to overlap leggings, but not tall enough to reach over my calf. As far as I know, no force on Earth will keep socks of this length up, unless they have something that provides more friction than a leg to hold on to. I like wearing these, in fact they’re my favorite socks right now. However, having substantial leftover yarn drives me crazy, and next time I’d like to get enough to make knee socks, so maybe I’ll look for two smaller skeins, or a really long one. If you’d like to make a similar sock, or see the knit-nerd details about the two heels and what I’ve learned about fitting sweet tomato heels so far, all that is on Ravelry. 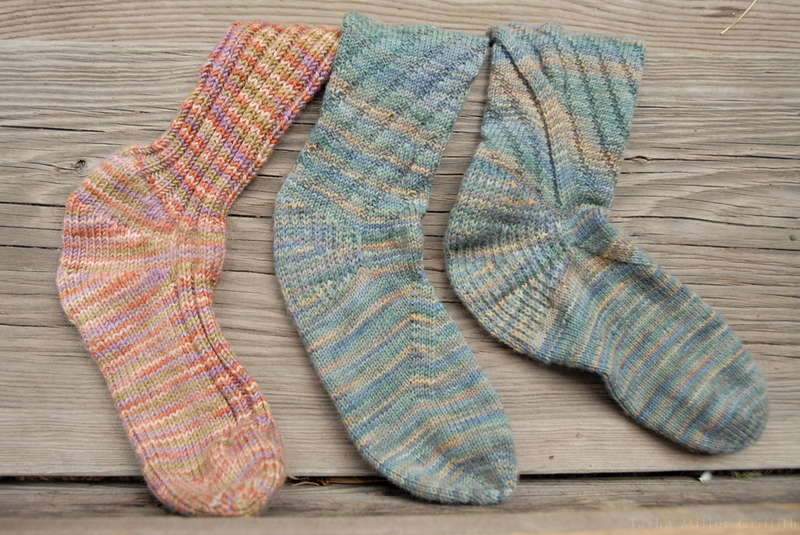 This pattern is the “Sweet Coriolis Socks” from Cat Bordhi’s Sweet Tomato Socks ebook. She also recommended this yarn in a workshop I took, it’s Mountain Colors Crazyfoot. 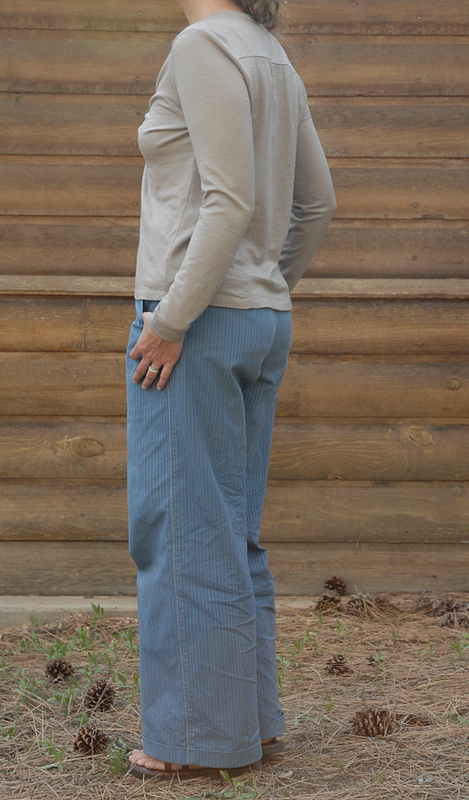 This particular color (“Chinook”) called my name at Purl in the Pines. I liked working with this yarn, although a fair amount of blue-green dye bled off in the first washing. We’ll see how they hold up! Cat Bordhi is one of my knitting heroines, and I know variations of this pattern have appeared in several of her books, so I was excited to try it. 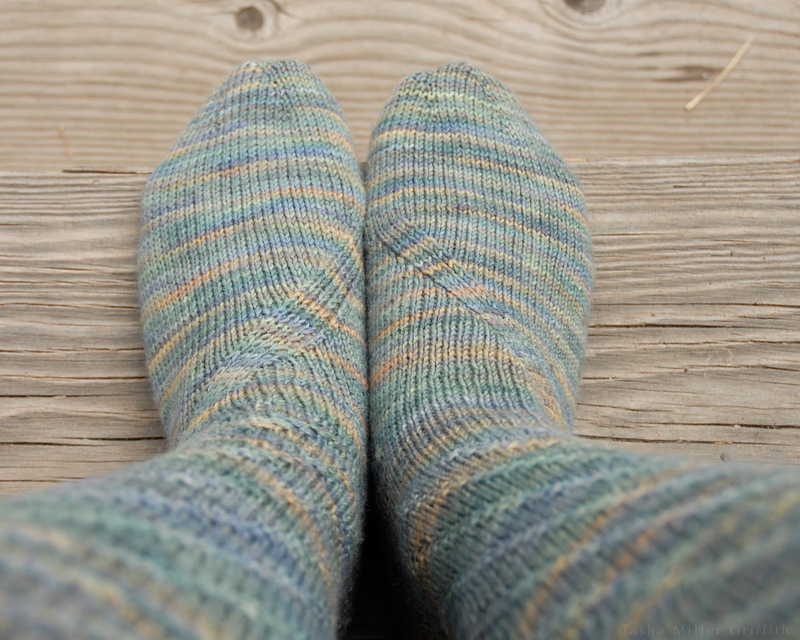 Although I like how the finished socks look, my brain and this pattern weren’t quite in harmony. I never really got into a flow with the coriolis ribbing, and I kept having to check to make sure I was in the right spot. And, the experiments I tried with the heels threw off the expected path for the coriolis band at the hinge of the foot, especially on the second sock, where it got lost for a while. If you’re still experimenting with the fit of your heel/foot, I’d recommend sticking with a pattern that holds steady on top of the foot, until you figure things out and can do some calculating ahead of time. I’m getting really close to a great fit with this heel, and I liked the padded variation I tried this time a lot. Still, I’m thinking I may knit some non-sweet-tomato socks for my next pair, if for no other reason than to get some perspective on the different heel techniques … there’s always more to learn, which is what keeps me knitting! As we near the end of Me-Made-May, it seems like a good time to share some thoughts about sewing, empowerment, and body image. Although I get a huge boost of self-sufficiency when I’m wearing the clothes I made, I actually don’t think much about sewing as it relates to how I feel about my body. Except for when I’m making pants. I originally wrote these thoughts as part of a proposed series on the Colleterie, which didn’t get off the ground, but it seems a shame not to get them out into the world. 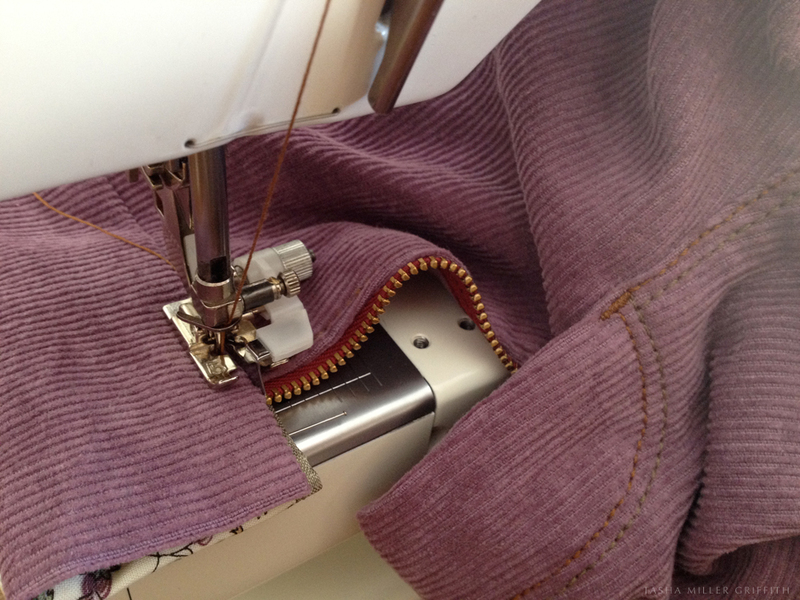 I thought about a lot of this again just recently when I was working on my trousers. 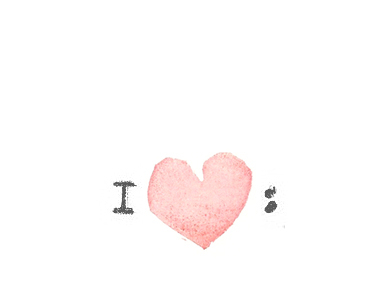 I’m lucky that when I was growing up, my parents always stressed that I’m just fine the way I am. I’ve never had a really negative image of my body. But I have always had trouble finding pants that fit at all, or were remotely comfortable. I would describe my figure in a nutshell as small and pear shaped. When I’m good about exercise, my thighs get firmer, but they don’t exactly shrink. In fact, in High School, when I was doing lots of power yoga every week, and in the best shape I’ve ever been, I just about gave up wearing pants altogether. It wasn’t worth it; they were just too uncomfortable. I have a vivid memory of sitting in class wishing I could just grab the top thighs of my jeans and yank upwards, and that the seams would pop down the sides, releasing my legs. I never actually tried it, but after that I stopped wearing jeans. Since then I’ve explored my style, how it relates to my body, and to how others see me, through my sewing—starting with long skirts. As you know if you’ve read this blog for a while, I’ve also been working on and off for years on pants that actually fit me. 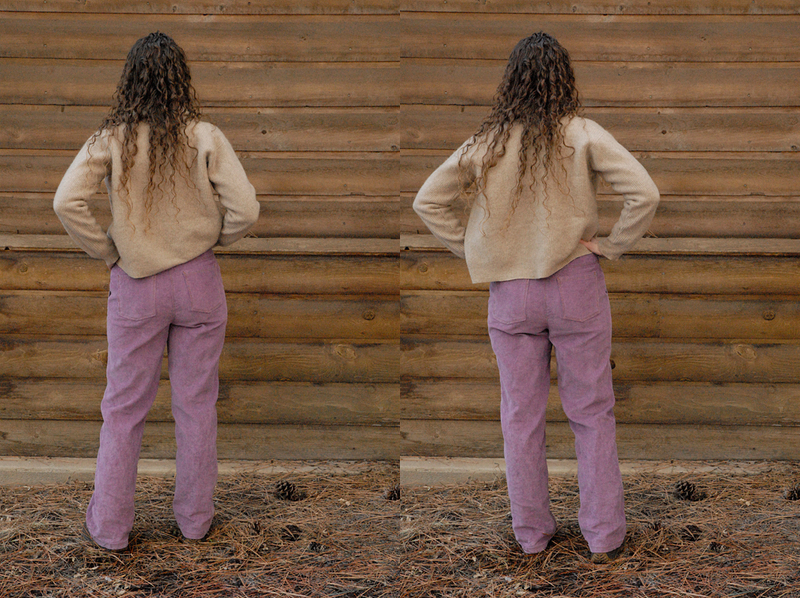 It wasn’t until I was making the purple pair that I realized how much not being able to find clothes that fit or flatter could affect my conceptions about my body. 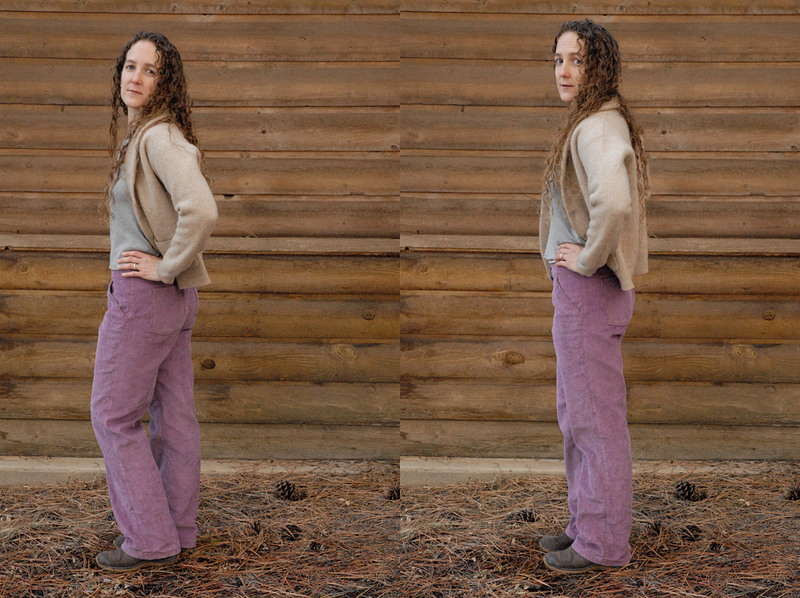 Those purple pants aren’t perfect, but they show off my shape and are comfortable—a miracle to me. When I’m standing in front of a dressing room mirror and no pair of pants I try on looks good or feels right, I think that encourages me to feel like I need to change, like my body is not right. I was fairly amazed at how, looking at my legs in these new me-made pants, it was so much easier to say, “I love my body! 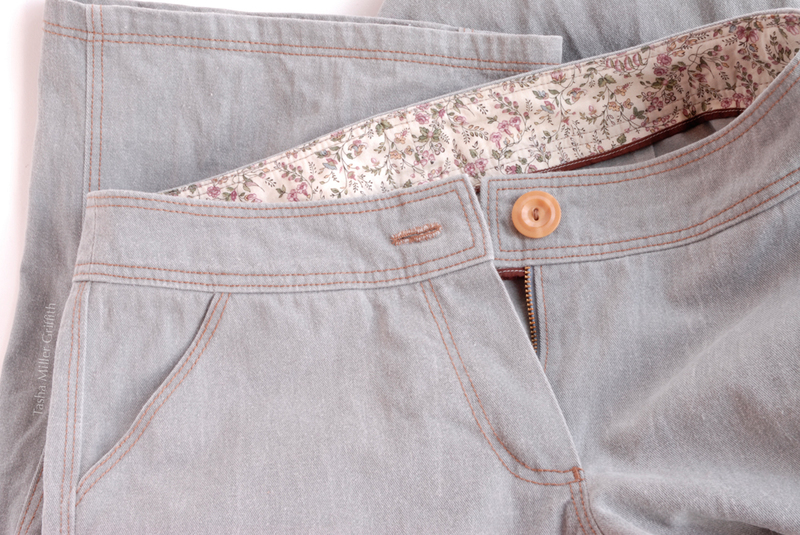 It’s so cute and curvy!” It’s not my body that needs to change—it’s the pants. From my hair to my thighs, I’ve had the best experiences with my body when I realize not only that I can’t change something, but that I shouldn’t be trying to change it, that the beauty the universe gives me is for me to embrace and to work with, not to fight. And I can only do that if I’m willing to think outside the box, to take the time and develop the skills I need to get what I really want and need. To me sewing, and making anything, is all about empowerment. Since I sew, I can break free from the consumer culture that gives me limited choices, while at the same time encouraging me to find fault with everything, in order to sell me more cheap stuff. Sewing is a way out of that cycle, and also a way in to a deeper and better understanding of my own body and taste, my personality, my unique self. Perhaps the best part is that this kind of freedom is available to anyone who wants it, anyone who’s willing to can their own jam or sew their own jeans. Let’s go get it, people! 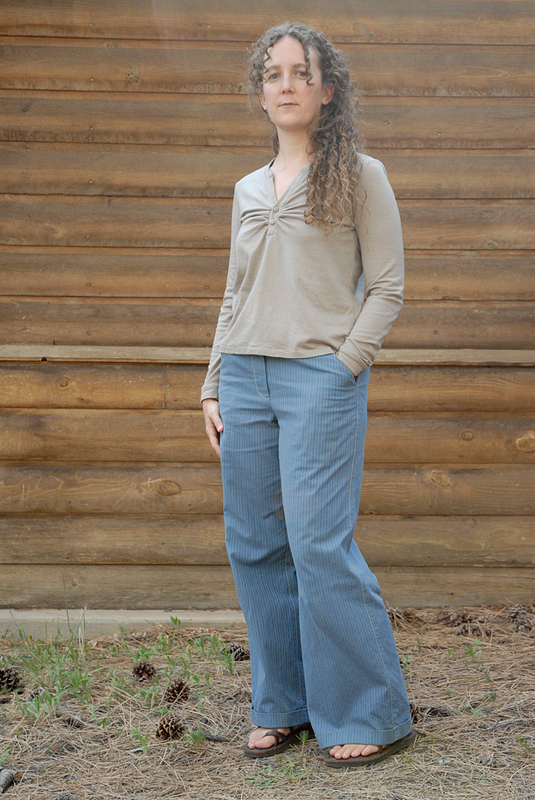 So, after talking about these tops last time, it’s time to talk about the pants! They’re more of a trouser style (which is good since folks on both sides of the pond can agree what “trousers” means, right?). I bought this fabric last summer at Nob Hill Fabrics in Albuquerque. I wasn’t 100% sure about it for trousers, but it looked promising. In truth, I am not 100% sure about it for trousers now. 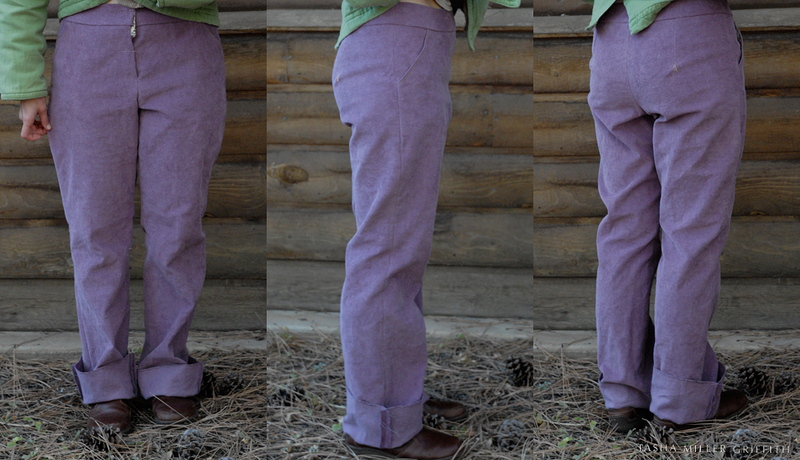 But, after the untimely demise of my fantastic purple corduroys (so sad!) I really needed a new pair of pants nice enough to wear at shows (in public where I am supposed to look somewhat professional, or at least not like a bum off the street). The odds of my finding a pair to buy that fit and that I like are close to zero, so I pulled out the blue fabric. While I was cutting it, something pretty cool happened. 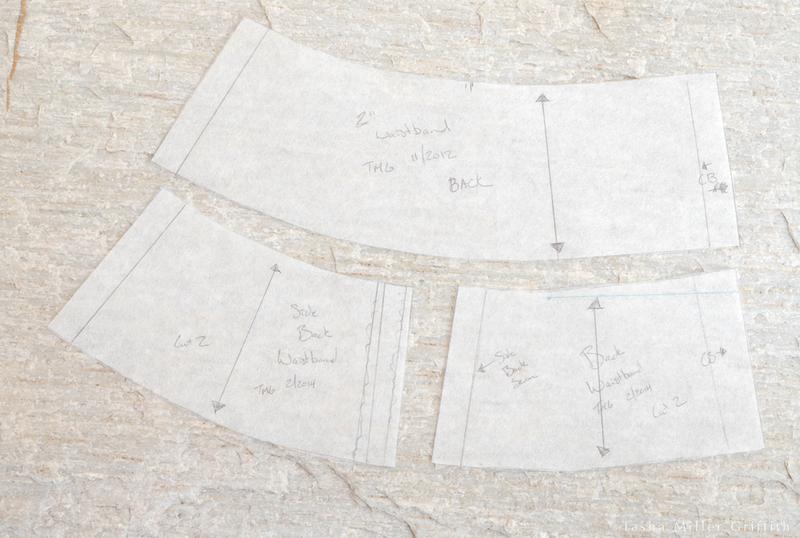 As I looked at the back waistband pattern, I got a sudden flash of insight: this piece is trying to take in too much curve, and it would be much better as two pieces, with a seam in the middle as well! So I traced it into two pieces which matched the existing width at the bottom of the waistband, and took in a little more at the top. 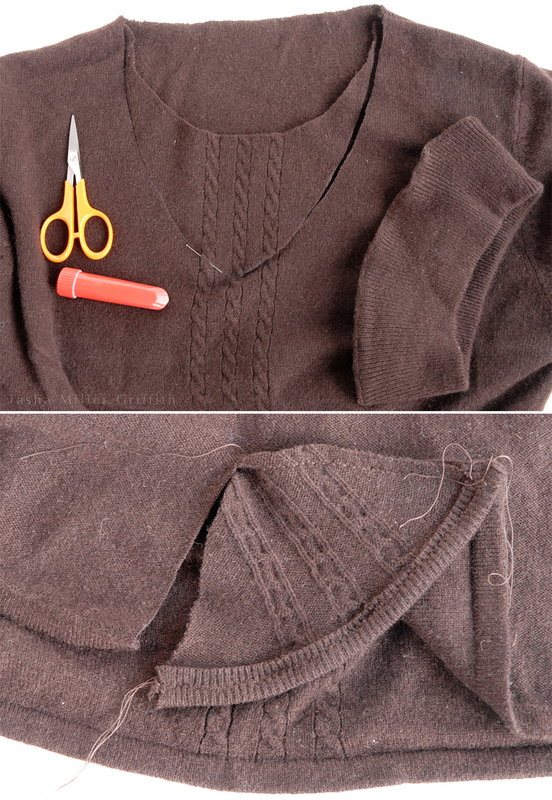 If you do this, don’t forget to add seam allowances to the edges at the new seam! 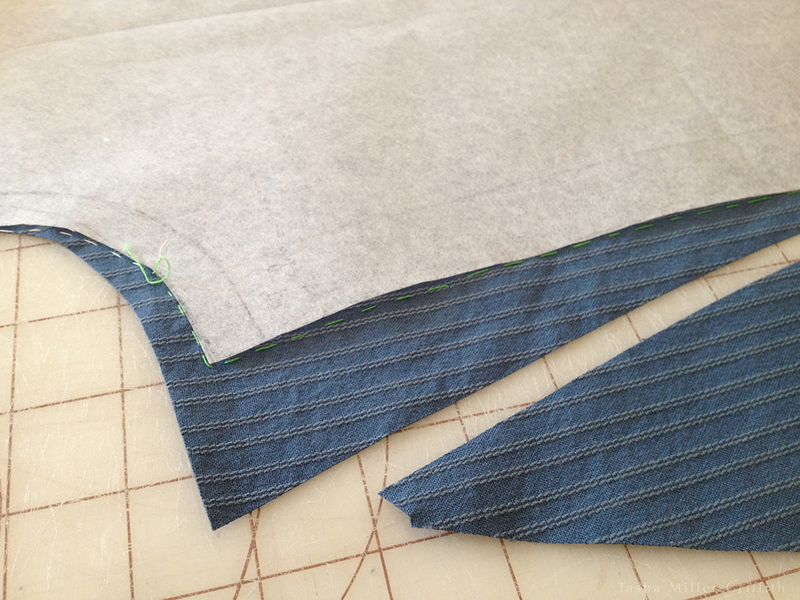 This approach fit the shape of my body so much better that I ended up doing the same thing on the front, so that I now have four waistband pieces instead of two. A step forward in fit. This is the next evolution of the traced from-existing-pants-and-extensively-altered pattern I used to make the grey pair. The main problem with those is that they are a little tight around the crotch seam, especially when I sit down. I will say that I’ve gotten a lot better at diagnosing what needs fixing in the fit of my trousers in the last year or two. At first, the fact that every part of the fit affects every other part made it nearly impossible for me to tell what I should change. But now, after fitting a few pairs, when I try some on I can feel which seams need more or less fabric in order to be comfortable and fit my shape. So I already knew (from wearing the grey pair) that I needed to let out the front inseam a fair amount. I wanted to cut the fabric outside of the pattern to make sure I would have enough in that area, so I decided to trace with thread the outline of the pattern. That way I’d be able to see where my new seam is in relation to the pattern, and transfer my changes back to it for next time (I can always add more paper to the pattern using this method). 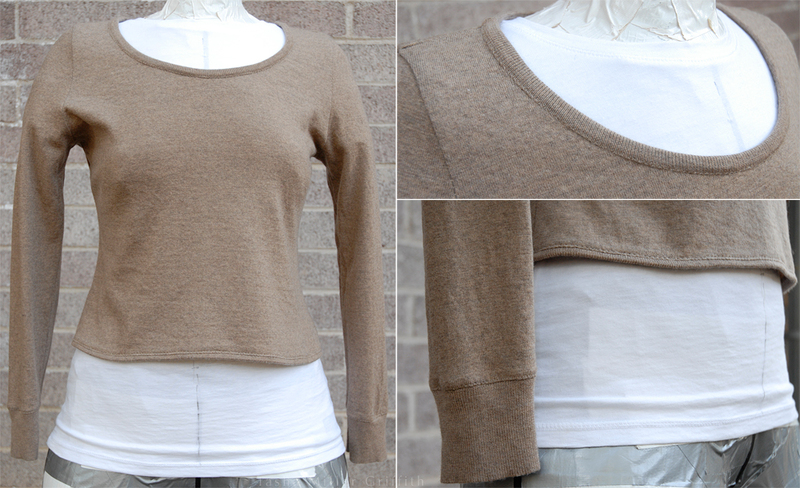 This worked great, I could see right where the pattern line was as I worked on the fit. So, I let out the front inseam until it felt comfortable, and then played around with the crotch seam and back inseam to get the look and fit I wanted. I want the trousers to show that I have a bum, without hugging it too tight, and then drop into a wide leg somewhat reminiscent of 30’s style. I got pretty close! To be honest, I may have overdone it on the amount of added room around the inseams, these feel so comfortable that they border on I’m-wearing-my-pajamas-outside. But when I put them on and sit down it’s sooo nice! The back welt pockets are pretty sweet, yes? This is something I’ve really been wanting in trouser-style pants. 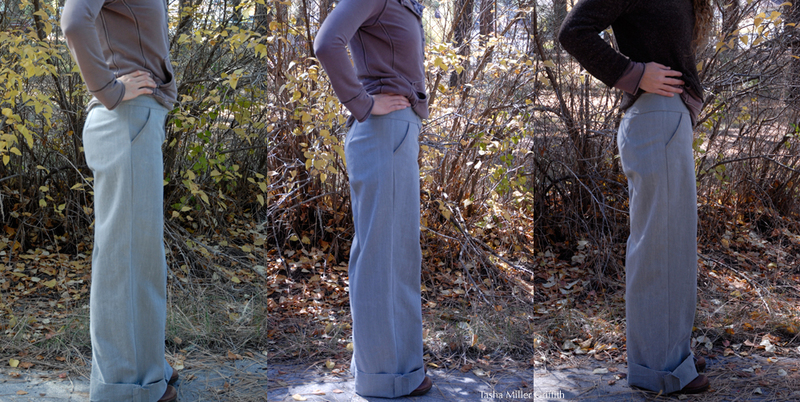 I have one old pair of thrifted Gap wide-leg pants that has them, with little flaps on top too, and I love them. I almost skipped them for this pair though, just because I was running a little short on time before we left for Texas, and I really needed to get these trousers done. You know how sometimes, these decisions are made for you, just by the circumstances? Well, as I got close to finishing the fit, two things became inescapably apparent: I could not figure out any way to get the tips of the back darts to look good (hidden by patch pockets in earlier pairs), and under some conditions, you could see the line of my undies through the fabric. So, pockets it was, and since patch pockets don’t go with the trouser style I wanted … I basically just kept those Gap pants next to my sewing machine and figured out the steps from looking at them inside and out as I went. Fortunately, I didn’t hit any major snags. 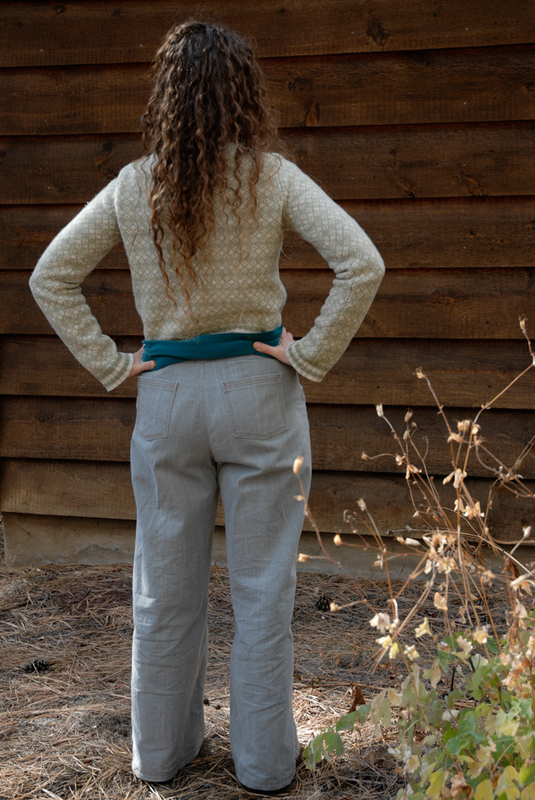 I have to admit, when I first tried the trousers on after finishing the pockets, my reaction was “no one told me they would look THAT cool!” I have a few tweaks to make next time, but overall, those back pockets are probably my favorite thing about this make! 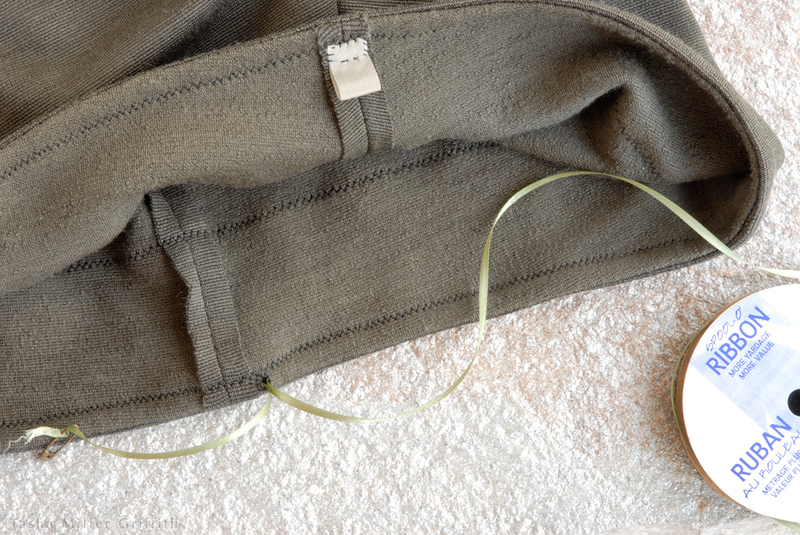 I had a hunch when I went to add the pockets that it wasn’t the fabric being pulled tight that was showing my undie-lines, it was the fabric being just a little thin and just a little clingy. I was right. Now that the pockets are in, you can see that there’s plenty of room for them. Sometimes you can see a shadow from the pocket lining, but that’s much better! While this fabric turned out fine, next time I will look for some with just a little more body for making trousers. I wouldn’t want it to be stiffer, just thick and soft enough to hold its own and skim over curves a little more. And, did you notice it wrinkles like all get out? I swear, I pressed the trousers before setting up to take photos, but 10 minutes of adjusting the camera, kneeling by the tripod in the sun and moving around, and it was pointless. I do think that wrinkles are less noticeable in real life than they are on camera though. Have I mentioned before that fitting and sewing trousers is a journey, not a destination? (Hint: yes.) I’m glad to get these under my belt, and to have a new pair to wear in public this spring. Happy May Day to all! Where to begin? I think I could talk about these pants and all their glories and implications well past what you would read. Well – I think I’ll begin with why they are purple, which will lead right into why they are fitted, which will lead right into why they are the best pants I’ve ever had. 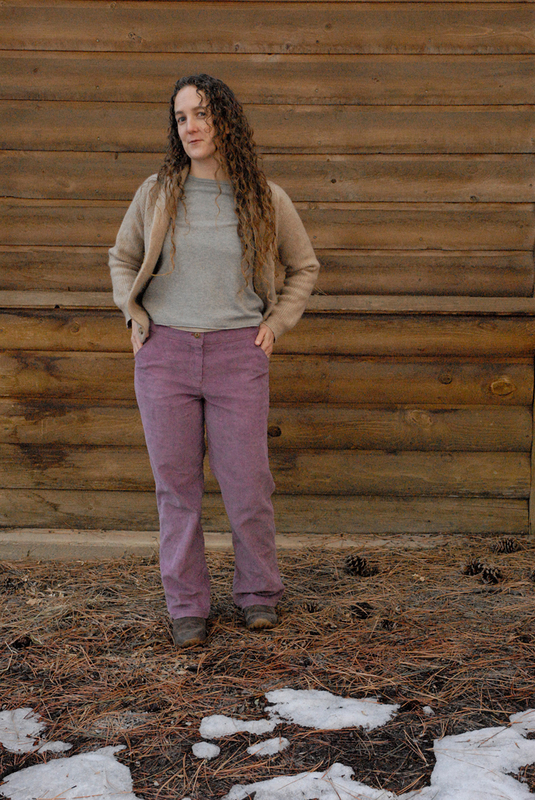 So, a few years ago now, my aunt got this pair of purple corduroy pants, and for some strange reason I fell in love with them at first sight. I’m not usually into purple, or brightly colored trousers, nevertheless I’ve wanted my own pair ever since. 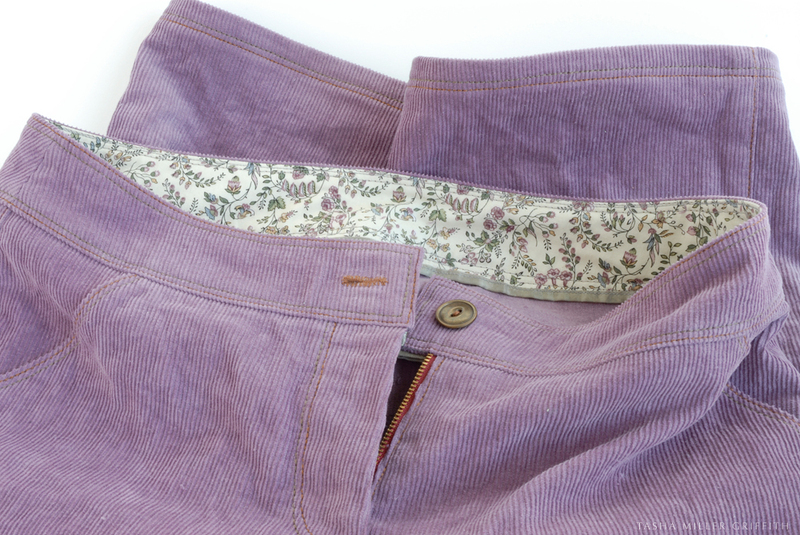 I found 1 1/2 yards of, get this, lavender hemp and organic cotton corduroy on the NearSea Naturals clearance page! (It had a “stain” on it, which washed right out.) Update: although I love love love the idea of this fabric, the color of this fabric, and the resulting pants, the fabric is just not sturdy enough. I got about a year of good-looking wear out of these before the corduroy pile started coming out, even with washing them inside out and not once putting them through the dryer, and that is just not enough for something I made. 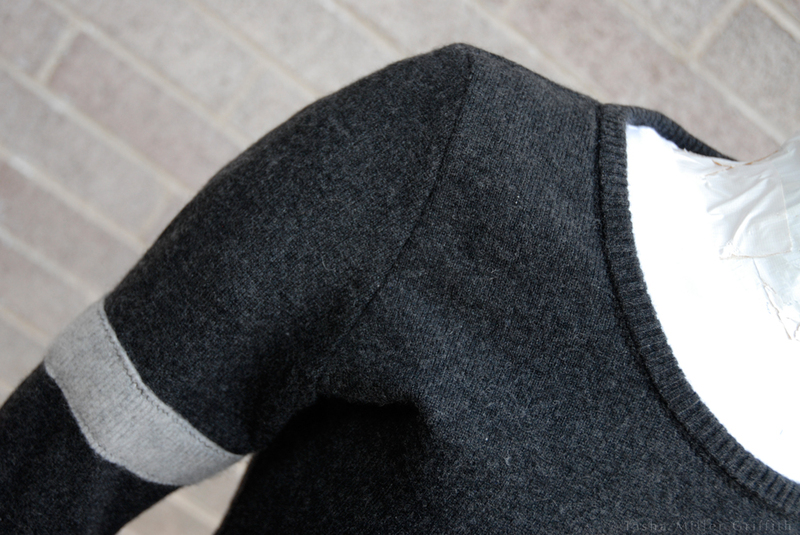 If anyone knows of a source for sustainable, long-lasting fabric, please let me know! The good news: all the work I did on fitting (keep reading) is already transferred to the pattern and waiting for me to find the next fabric! I thought this was the perfect amount of fabric. 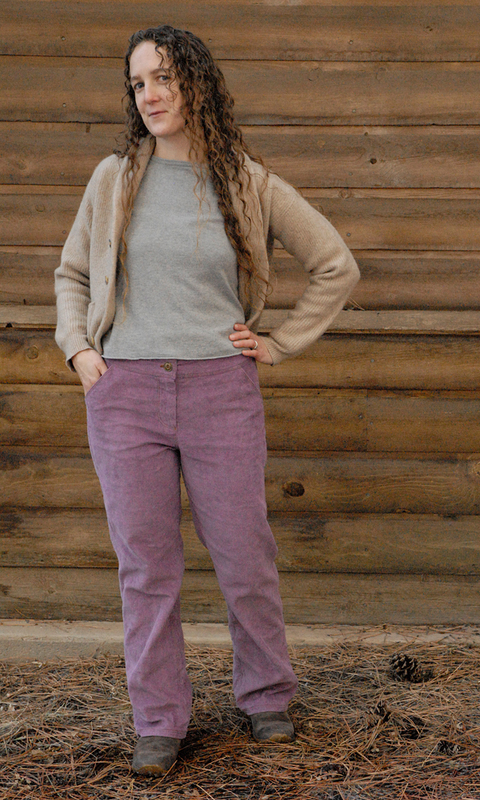 I planned to make another pair just like my grey pants, even though I wasn’t sure that wide leg would be the best look for purple corduroys, I would figure out that fit first, and save more close-fitting pants for another day/next fall maybe. 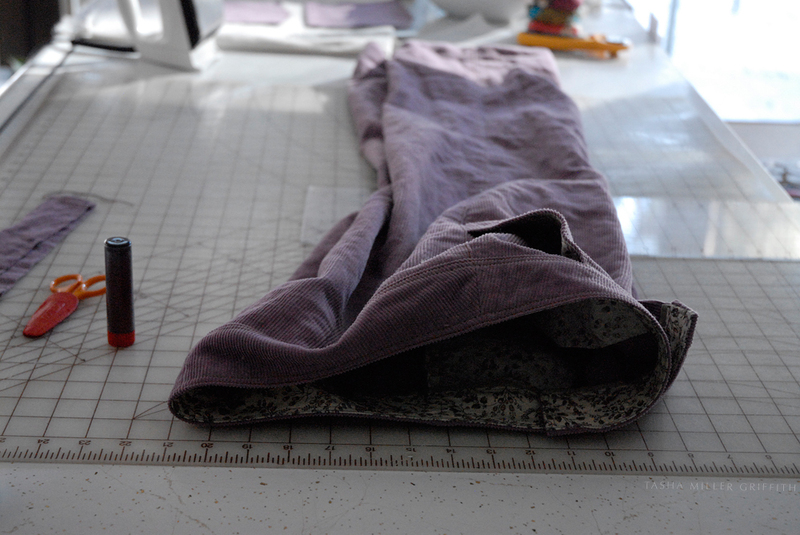 Well – it turned out that all the wide leg pattern pieces would not fit on this much fabric. To fit them in I had to narrow the legs quite a bit. Well. I just tapered the tops of the pattern pieces from the grey pants into the narrower legs, cut them out, and this is what I got. Clearly those fabric saddle bag areas on the sides had to go straight away, that was the easy part. Getting a better fit through the seat/inner thigh area took a lot more work. 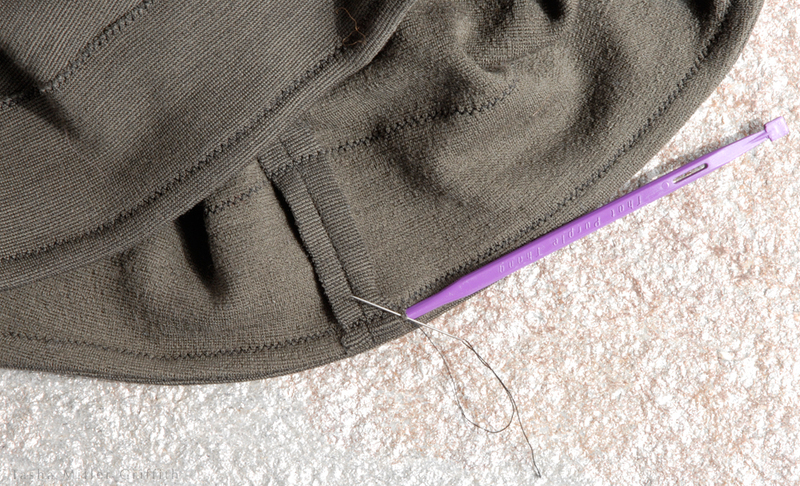 Every day for weeks, my sewing time consisted of: ripping out and re-basting in a slightly different position some part of the crotch seam and/or inseam and/or side seam, trying the pants on, deciding what to rip out next (often the same part). Although I worked on these only a little bit each day (partly to keep myself from getting frustrated and doing something hasty/stupid), I thought a lot about how life is like fitting pants. The baking equivalent might be yeast bread, or even macarons. There are a lot of variables, and each one seems to affect all the others, so that a small tweak in one area can change all kinds of things I would not expect. But, if I just keep plugging away, trying things, seeing what happens, I will eventually reach a place where I am very happy with the results. Well – I really could not be happier with this result! Although I have tweaks to make in the next version (pants are clearly a journey, not a destination) they are the first pair I’ve ever had that really fit and flattered my figure, they’re incredibly comfortable, and I’m ridiculously satisfied with myself when I wear them. If it wasn’t for the fact that things need washing, (Ok, and I do love skirts, and some days are for grubby clothes, etc.) I might conceivably wear these straight through until they wore out. I took out all that extra I added to the back inseam of the grey ones, and then some. Clearly a different fit requires a different shape. See that diagonal wrinkle across the back hip in the first fitting? I tried all kinds of things to get rid of that; letting out the side seam, unpicking the waistband and pulling the pants up, but nothing worked, until I saw something in Patternmaking for Fashion Design by Helen Joseph-Armstrong (which is one of my all-time favorite sewing books, expensive but worth it, I asked for it for Christmas one year). It was one of my cousin’s textbooks at FIT in San Fransisco, and it shows you how to draft a pattern for just about anything you could ever want to make, plus all kinds of construction techniques. It’s designed more for the fashion industry that for home sewers, and there’s not a lot about fitting, so I guess it says something that there is a section on pants fitting, where I found an illustration of a similar wrinkle with this note, “insufficient dart intake for dominant buttocks.” That’s not how I’d like to think about my derriere, but the part about the dart totally worked! I had been leaving that dart alone since I fit it in the last pants, but clearly it’s not a good idea to start think of any part of the fit as “finished” when I am changing the rest. I used my edge stitching foot for the first line of top stitching (with a size 100 topstitching needle, moving the needle slightly to the left), and it worked great! It was much easier to get an even stitching line with that little guide riding right on the edge. 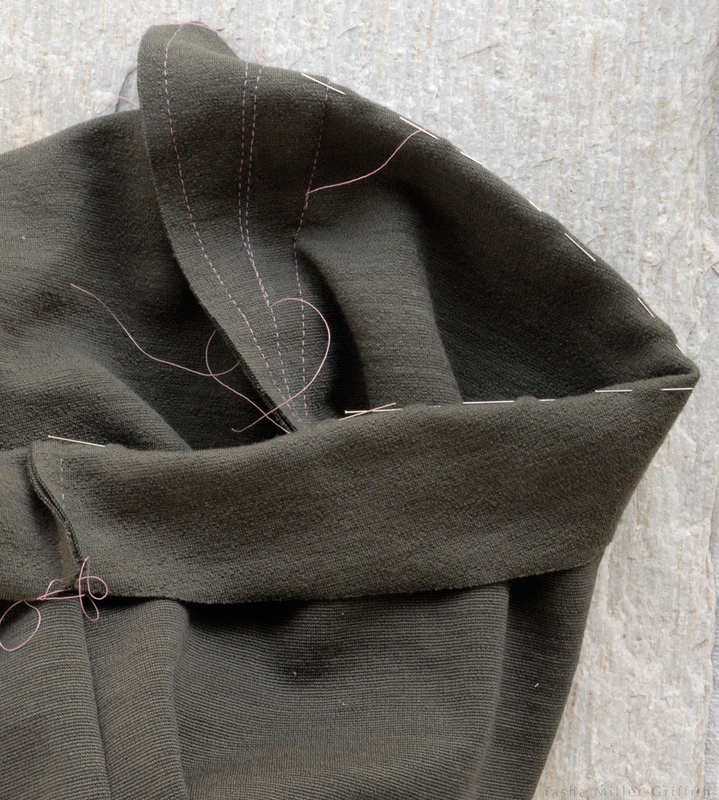 I am now trying to figure out how I can use a similar guide for for the second line of topstitching, further to the inside.. Anyone know of a foot like that? I used two colors topstitching and I really like it, one pair of Bryan’s jeans has that look and I decided to try it out. I trimmed a bit of the waistband lining before applying the rayon ribbon to the bottom edge, next time I’ll trim a bit more, but I like this finish. If the legs look a bit long, I left them that way on purpose. I keep noticing that the hems of cotton pants tend to creep up just a bit over time with washing, usually after I fix them just how I want them. I’m not sure what the shrinkage of hemp is, but if these don’t get any shorter after a while I can always hem them up a bit more. By the way, the above shot of the inside waist is probably the closest I got to the actual color, for some reason this purple seems to be hard to capture. That’s about it, I guess, unless of course you want to talk some more about sewing, body image, and the power of DIY, etc. . . . if you see me around, I’ll be wearing these pants, and feeling happy!